Gelatin silver print snapshot. Small format. 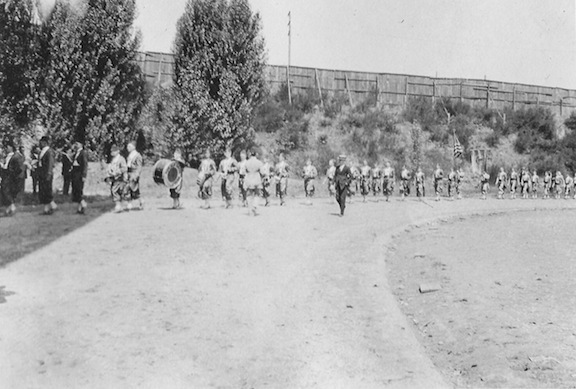 View at Multnomah Field of procession forming or finishing of DOKK Knights. A long line of men in Zouave-style parade uniforms, complete with fezzes. One man carries a kettle drum with a DOKK emblem on it. Further back, a man carries an American flag, and just behind is carried banner with an emblem and probably with a Lodge name on it. Behind them is an embankment overgrown with brush and shrubs, at the top of which runs a very tall wooden fence. This is probably the outside face of the field. And stamped in blue ink the number 45. Multnomah Field has survived the century and is now Jeld-Wen Field, home of the Portland professional soccer team, the Portland Timbers. 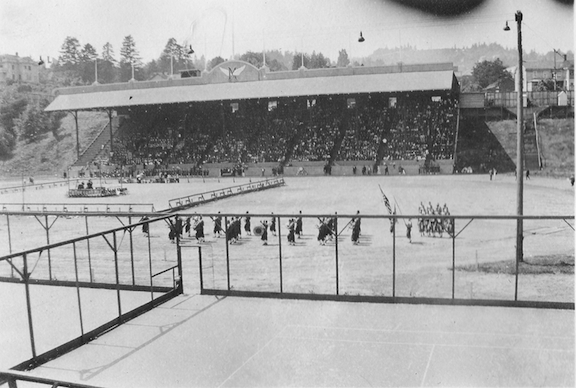 View across a platform at Multnomah Field of a DOKK marching band maneuvering in formation across the field. Visible are a kettle drum, cymbals, and at least one woodwind instrument (at high res zoom). In background is the grandstand, which is packed with onlookers. 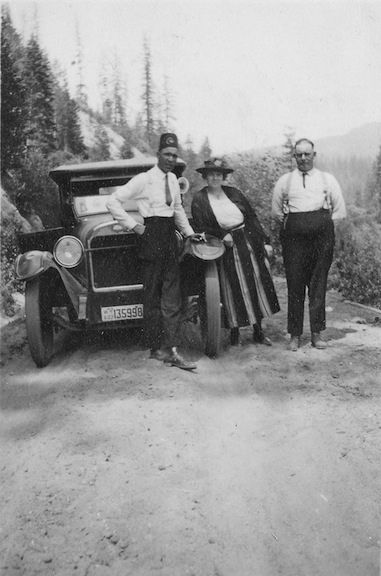 Two men and a woman, standing in front of a touring car, which is parked on a dirt road, seemingly on the side of a mountain. Pine forests can be seen in distance. Man on left is wearing a rather short tie and a DOKK fez. Woman is in brimmed hat and a striped dress. Man on right is heavier set and is wearing suspenders. Assumed to be contemporary with TAFC.2012.11, and .12, as these three were bought as a lot of photos. A group of 23 men in fancy dress uniform for URKP. In the center stands a flag, furled, but which appears to say “Philadelphia” on it. Two additional portraits of individuals are collaged in, UR and LL as vignettes. The uniforms are dark, most with a single row of buttons down the front. 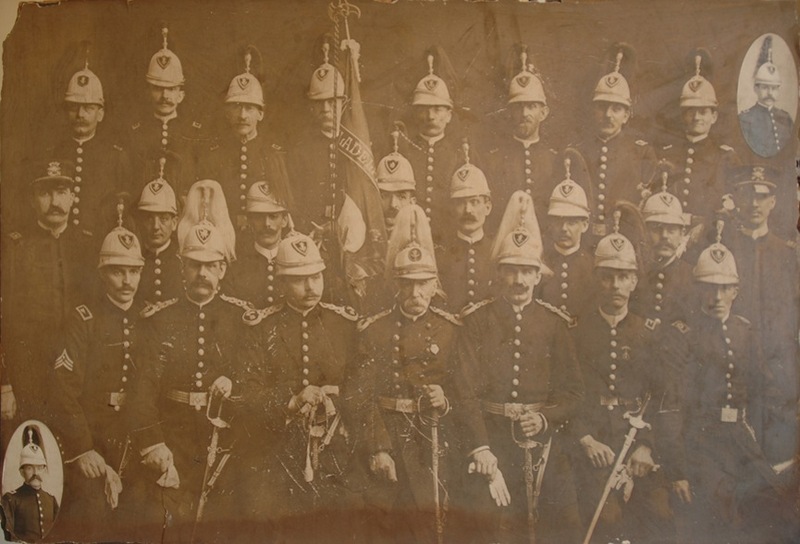 All but two of the men wear the white Pikelhaube-style helmets, with various horsehair plumes, distinctive to the URKP, the other two wearing police-style caps. Many of the men in the front row are armed with sabres or other swords. 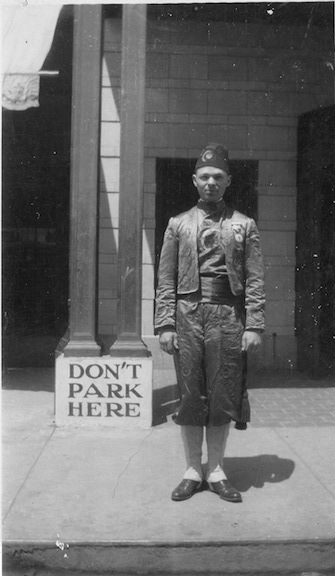 Standing portrait of a man in DOKK fez and Zouave-style parade uniform. Next to him on a block supporting architectural upright is lettered, “DON’T PARK HERE.” Lodge name on his fez is not quite legible, second word is “WAH” and the number may be 120. Verso, stamped in black ink is the number 528. Toned gelatin silver print. 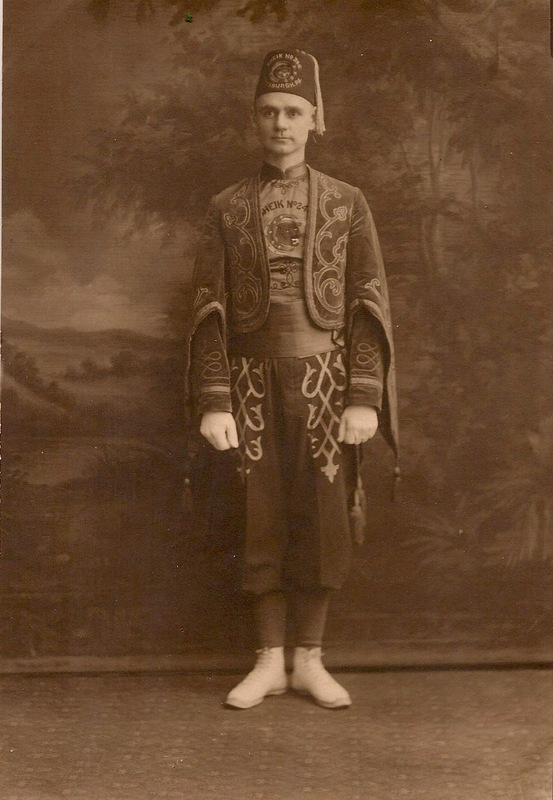 Standing portrait of a man in an elaborate Dramatic Order Knights of Khorassan parade uniform, a Zouave-style costume. An embroidered jacket with long, flowing sleeeves decorated with tassels. White gloves. Pantaloon pants down to leggings and white shoes. A broad sash high up his belly, to a shirt with a high collar which is embroidered with a DOKK tiger and reads “Sheik No.24” on the chest. His fez is a standard DOKK fez which also reads Sheik No.24 above the tiger and Pittsburgh, PA below. He stands in front of a landscape backdrop with hills dexter and trees behind him. Verso, a photographer’s stamp: S.E. Stedeford PHOTOGRAPHER No.231 Fifth Ave. Pittsburg, PA. The heavy brown card enclosure (faux leather texture) that originally held the photo (in pieces and discarded) had a hand-written name, “Smith” in black pen.